A simplistic indicator informing a user on RSI divergence by sending messages to mobile device and email. To configure the push-notifications read your MetaQuotes ID from the Metatrader 4 app on your mobile device and write it to the "MetaQuotes ID" field in the Metatrder 4 terminal on your computer. More details: https://www.metatrader4.com/en/trading-platform/help/setup/settings_notifications. To monitor multiple instruments or multiple timeframes of one instrument, it is necessary to run the indicator on each chart. 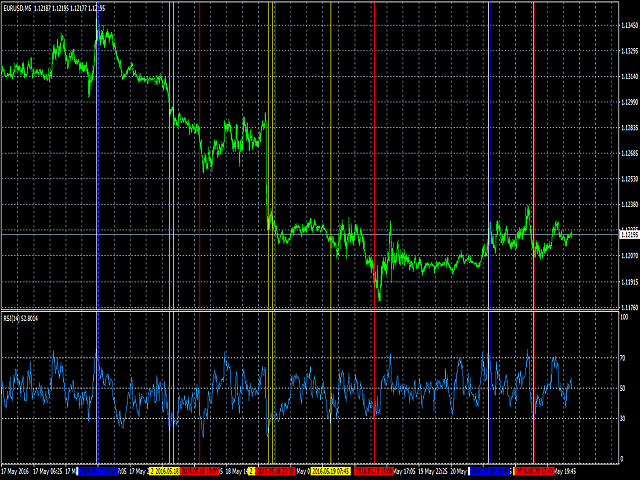 The indicator draws 2 vertical lines, marking the 2 RSI extremums which formed the divergence. You get the alert, open the charts and make a decision. Indicator not showing on the charts.